Vancouver, B.C. - Corvus Gold Inc. ("Corvus" or the "Company") - (TSX: KOR, OTCQX: CORVF) is pleased to announce the latest results from diamond drilling in the Yellow Jacket Zone at the Company’s 100%, North Bullfrog Project near Beatty, Nevada. Hole NB-12-138, which is outside the current in-pit resource as reported in the Preliminary Economic Assessment (NR 12-07, Feb.28, 2012) is the fifth core hole to be drilled in the Yellow Jacket Zone that encountered high-grade gold mineralization (Table 1). This latest intersection returned three separate high-grade intervals with the best being Â 16.2g/t (0.47 ozs/t) gold and 1,218 g/t (35.5 ozs/t) silver over 5.4 metres including 2.1 metres of 33.0 g/t (0.96 ozs/t) gold and 2,870 g/t (83.7 ozs/t) silver within quartz veined hydrothermal breccia. These high-grade intervals have elevated selenium and tellurium values similar to those reported in the silver-rich gold mineralization found at the historic Bullfrog Mine approximately 10 km’s to the south of North Bullfrog. High selenium values are an important characteristic at the Ken Snyder deposit in northern Nevada. The results continue to confirm the continuity of the structurally controlled, high-grade gold mineralization previously reported from this area (NR12-10, Mar. 22, 2012) and open up an attractive new high-grade gold and silver target at depth. Jeff Pontius, Corvus Gold CEO states: "The high-grade gold and silver mineralization encountered in NB-12-138 continues to confirm our covered, feeder zone target concept, opening up significant potential for expanding this very attractive zone of mineralization. This style of high-grade mineralization has produced exceptional deposits throughout Nevada and we are excited about further defining its potential on the North Bullfrog project." *Intercepts calculated with 1 g/t cutoff and up to 0.35 m of internal waste. The Yellow Jacket target is in the northern part of the district currently outside existing pit perimeters (Figure 1). 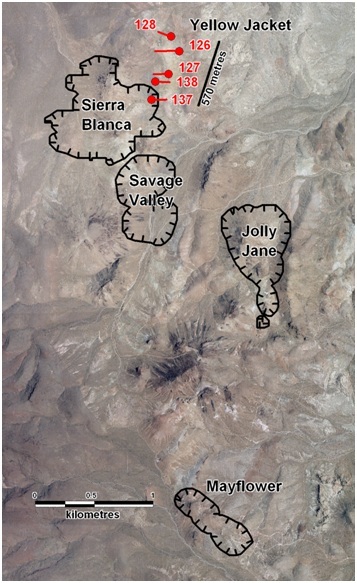 Five diamond drill holes along the Yellow Jacket structural corridor have intersected an extensive structural zone with multiple styles of gold mineralization including both quartz veining and pyrite replacement of iron-rich lithologies. The style of quartz veining found in NB-12-138, which includes colloform and crustiform quartz, is different from that found in the other holes and represents a more dynamic and productive part of the Yellow Jacket feeder zone system. These new veins are associated with multistage hydrothermal breccias with the highest grades associated with visible gold and acanthite, a high-grade silver mineral. Prior to this intersection, most of the observed quartz veining hosting high-grade gold has been relatively uniform textured milky grey quartz with pyrite which may have been distal to the more dynamic hydrothermal zone intercepted in hole NB-12-138. This current high-grade zone displays evidence of very active boiling at depth and bodes well for discovery of more elevation controlled high-grade mineralization at depth along this broad, +2 kilometre long structural target. Figure 1: North Bullfrog Project area showing the location of Yellow Jacket structure and diamond drill holes completed in the spring program. For reference the locations of the life of mine pits from the Preliminary Economic Assessment (NR 12-07, Feb. 28, 2012) are shown. Results from holes 126 through 128 were released earlier (NR 12-10, Mar.22, 2012). Results from hole 137 are pending. The current North Bullfrog program drilling is focussing on infill drilling, advanced metallurgical work and environmental baseline characterization studies in conjunction with a completion of a feasibility study by early 2013 on the Mayflower deposit. The recently completed financing has now provided the Company with the financial resources needed to rapidly advance the mine development assessment of the North Bullfrog area as well as continued exploration of this major new high-grade Nevada gold discovery. Corvus controls 100% of its North Bullfrog Project, which covers approximately 43 kmÂ� in southern Nevada just north of the historic Bullfrog gold mine formerly operated by Barrick Gold. The property package is made up of a number of leased patented federal mining claims and 461 federal unpatented mining claims. The project has excellent infrastructure, being adjacent to a major highway and power corridor. The Company and its independent consultants completed a robust positive Preliminary Economic Assessment on the existing resource in February 2012.